Three years ago today, I put on the fanciest dress I'll ever wear, a very long veil that was quite fun but also tended to blow everywhere and get stuck on things, and walked down the aisle towards that whole marriage thing. Here's to three more years, and three more after that, and on and on. Happy anniversary, darling! Aww, those are great pictures! Happy anniversary. Happy anniversary! These pics are gorgeous. 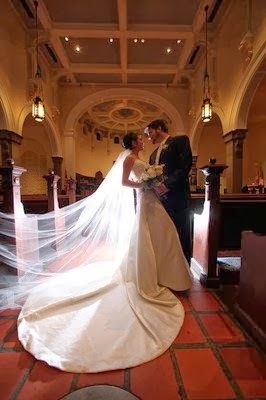 I LOVE that pic of your veil blowing everywhere. The other one is very pretty as well! Happy anniversary! Beautiful pictures- especially you and your husband!